Harris T Mitchell was born on 15 October 1915. He was commisioning as a second lieutenant in the US Army on 10 April 1942. Lt Mitchell joined the 2nd Battalion of the 503rd Parachute Infantry Regiment and trained in airborne assault tactics at Fort Benning before shipping off to Australia to join the battle for the Pacific. Harris Mitchell was promoted in June 1943 to Captain and he participated in the battle for Noemfoor. 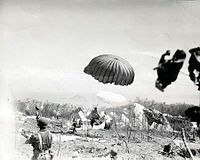 On 3–4 July 1944, 1st and 3rd Battalions of the 503rd were delivered by parachute to Kamiri Airfield on the island of Noemfoor off the coast of Dutch New Guinea, sustaining significant casualties from the jump. To reduce further casualties, the 2nd Battalion was delivered amphibiously. At the Battle of Noemfoor, the 503rd played a major role in the elimination of the Japanese garrison on that island. By August 1944 Captain Harris was promoted to Major and became the executive officer of the 3rd Battalion. Following a non-combat landing on the island of Leyte in the Philippines, the 503rd Regimental Combat Team (RCT) made a major amphibious landing on Mindoro Island in the central Philippines on 15 December 1944. 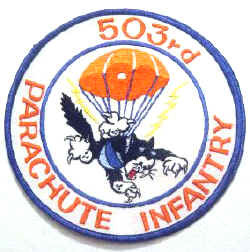 Originally, it was intended for the 503rd to jump on Mindoro, but due to inadequate airstrip facilities on Leyte, an airborne landing was not possible. During the Battle of Mindoro, the 503rd was subjected to intense air and naval actions, at one point being shelled for 25 minutes by a Japanese naval task force. On 16 February 1945, the 503rd RCT jumped on Fortress Corregidor ("the Rock") to liberate that island from occupying Japanese forces. 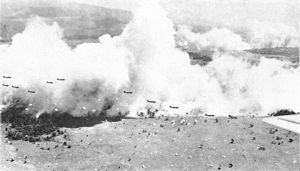 Braving intense fire, the paratroopers rushed forward and overcame the heavy blockhouse defenses, dropping explosives into embrasures to kill hidden Japanese gunners. For its successful capture of Corregidor, the unit was awarded a Presidential Unit Citation and received its nickname, "the Rock Regiment" from it. During these intense and fierce battles with the Japanese defenders, Major Harris Mitchell was awarded the nation's third highest valor medal, the Silver Star, for gallantry in action. Major Harris Mitchell also was awarded the Bronze Star Medal for bravery and the Purple Heart for combat wounding. 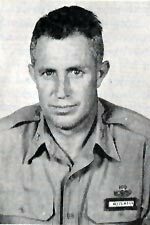 LTC Harris T Mitchell, Sr., retired from the US Army in July 1963 and lived in the Huntsville, Alabama area. Harris T Mitchell died on 13 January 2002 and is buried in the Maple Hill Cemetary in Huntsville, Alabama.